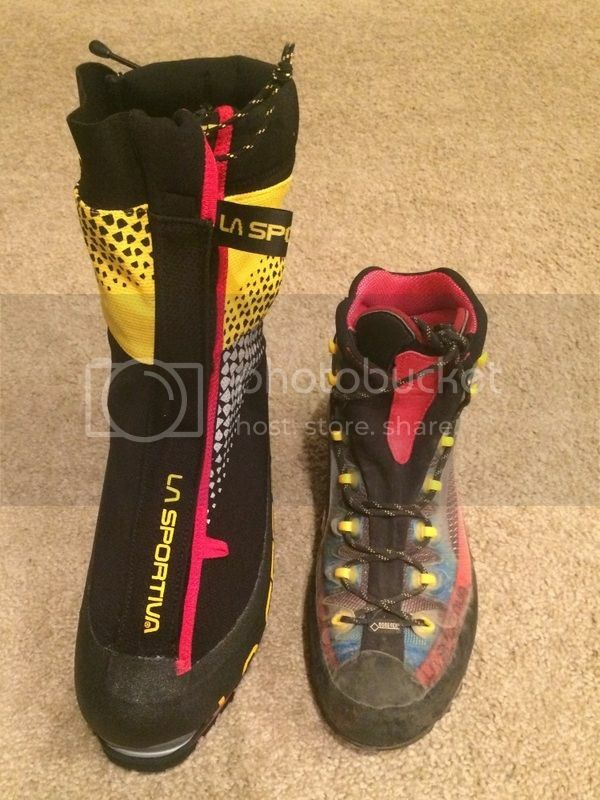 The G2 SM is a newer (and 200g lighter) double boot option compared to La Sportiva's other offerings (the Spantik and Baruntse). 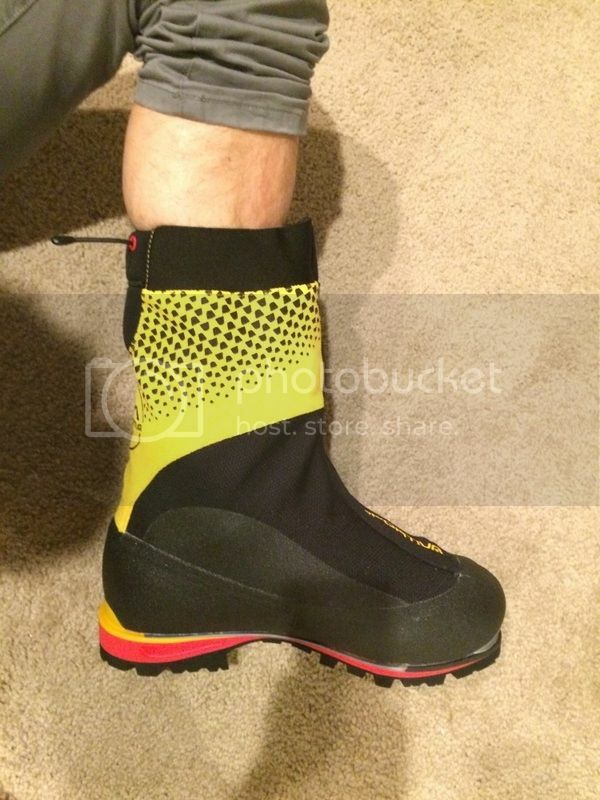 As for sizing, I wear a 42.5 in the Trango Cube GTX and chose the same size for the G2. 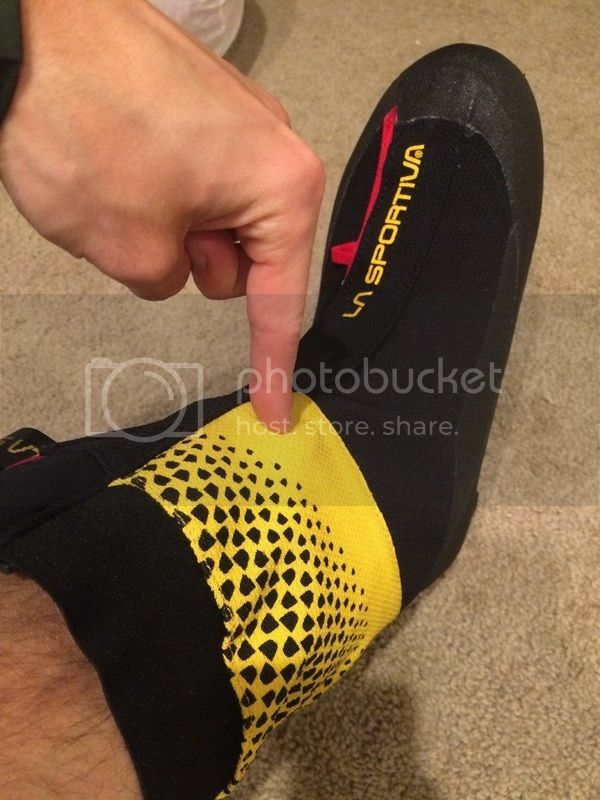 The sizing is spot-on - there's plenty of room in the boot for a thick sock and toe-bang shouldn't be an issue. 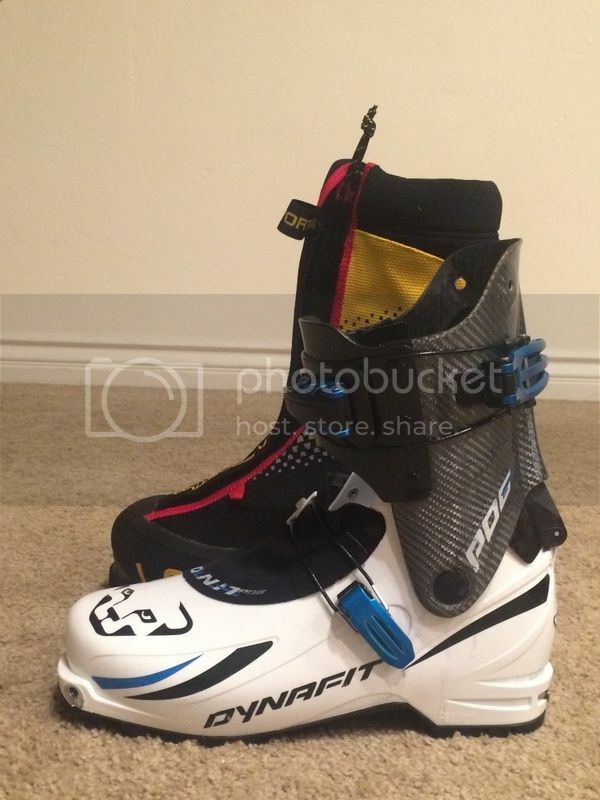 I think the quoted weight is for a size 42, so about 25 g more per boot for a size 42.5. The outer shell has an integrated gaiter composed of an elastic Cordura and a waterproof zipper with velcro flap closure over it. 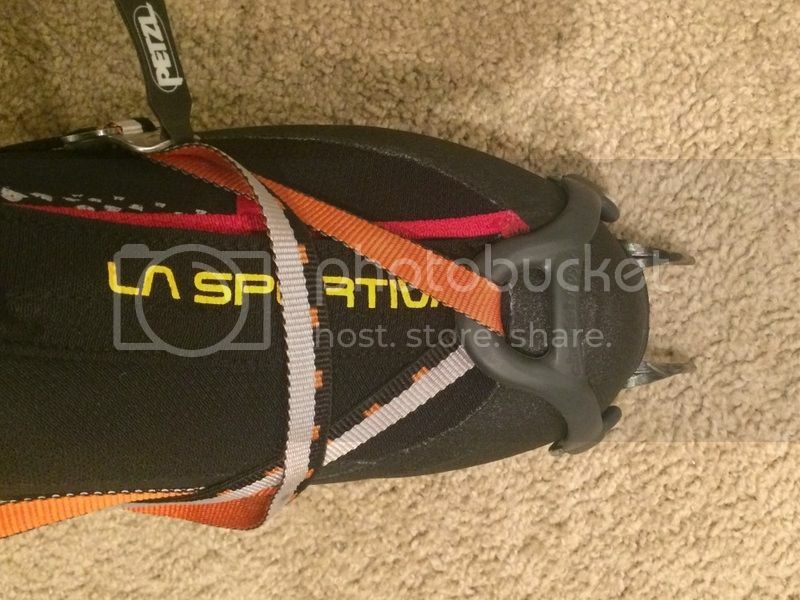 There's a drawcord around the very top of the boot to tighten up the gaiter to one's leg. 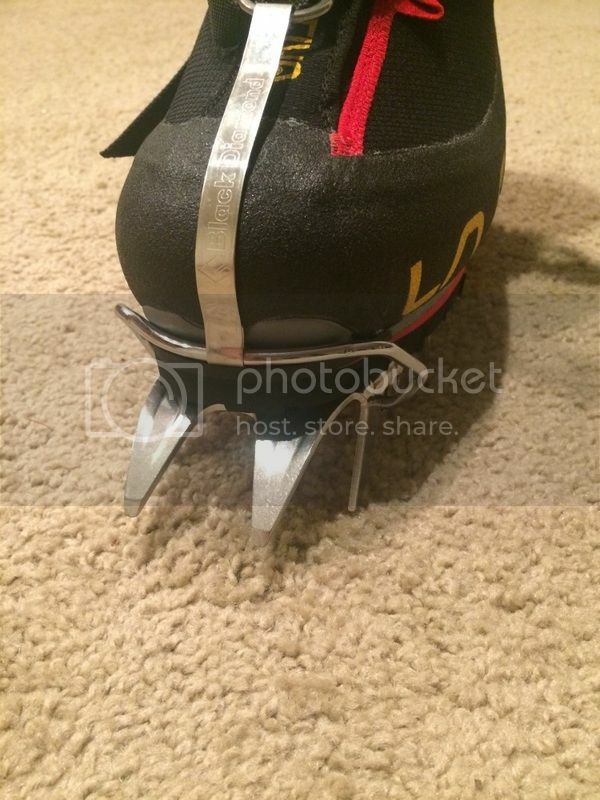 The boot itself has a dual Boa closure, consisting of a Boa knob for tightening the boot below the ankle and another knob for tightening the boot above the ankle. 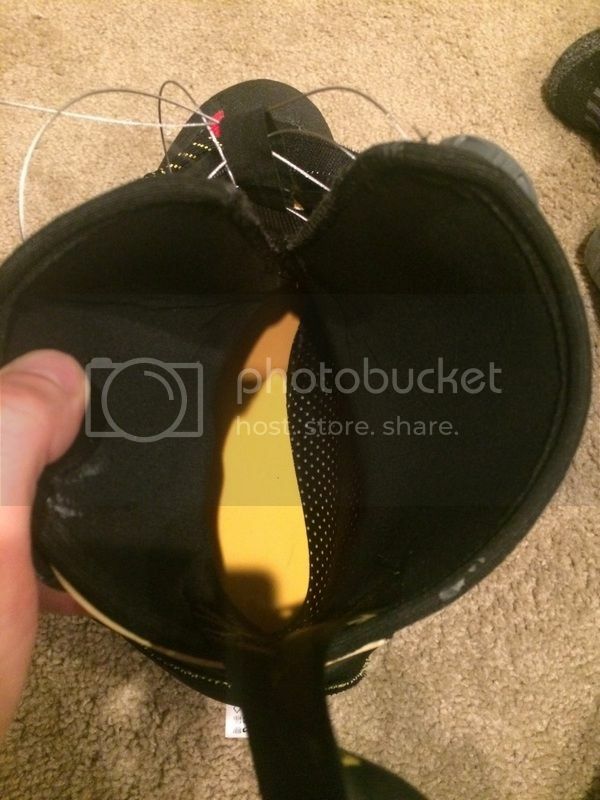 One concern is the Boa knob on the side of the shell getting knocked into rough surfaces and breaking or abrading the yellow elastic Cordura. Time will tell. 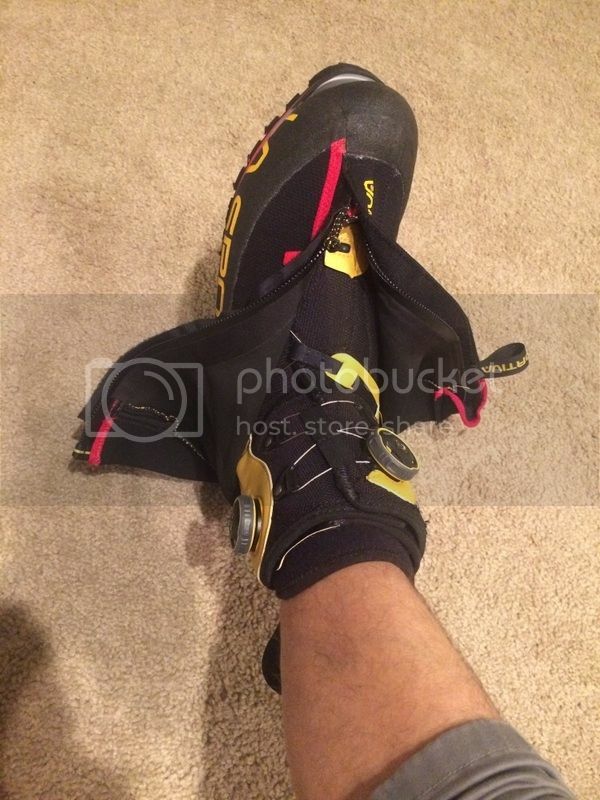 The liner is very light, consisting of separate velcro closures for below and above the ankle. It's a pretty simple, very light, insulating foam liner. The bottom of the outside of the liner has a very rough, almost sandpaper like coating on it to grip the interior of the boot. 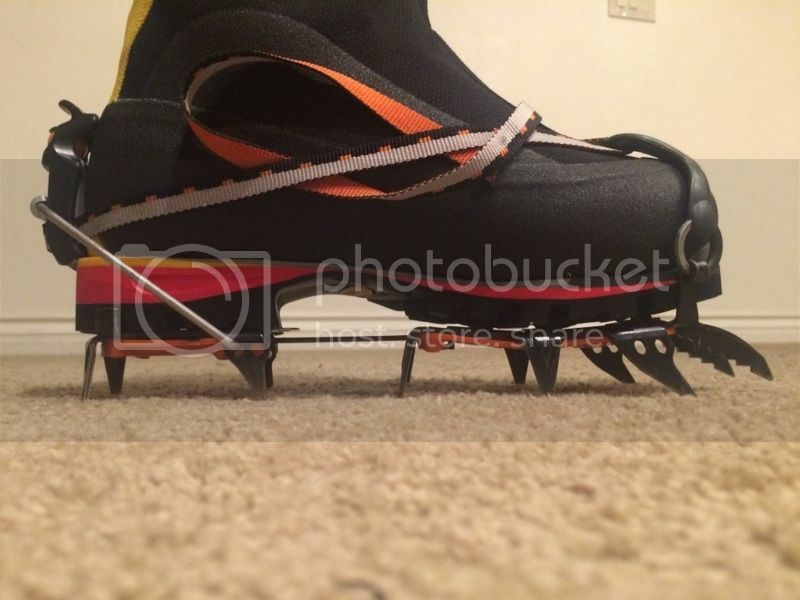 I fit two different crampons to the boot (fully-automatic Black Diamond Serac and semi-automatic Petzl Sarken). 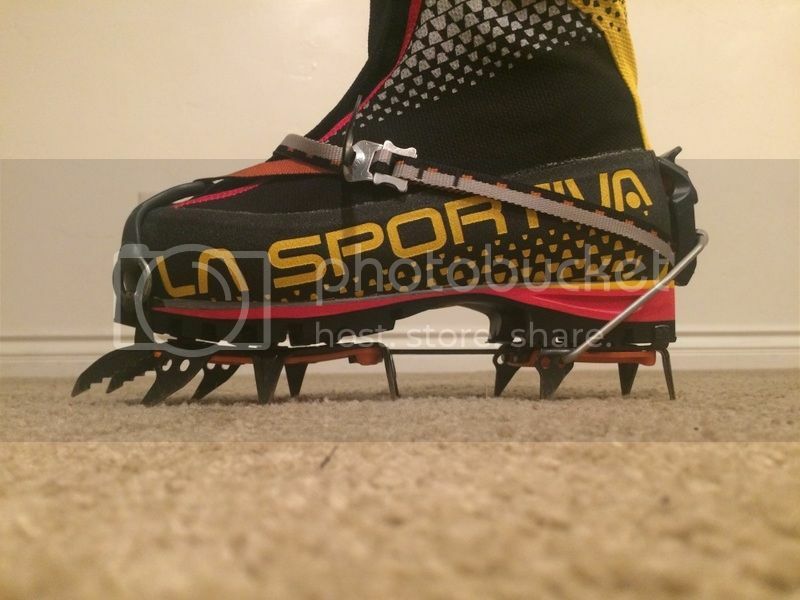 Both crampons fit sercurely with no slop or movement. I only wore the G2s around my house, going up and down the stairs. 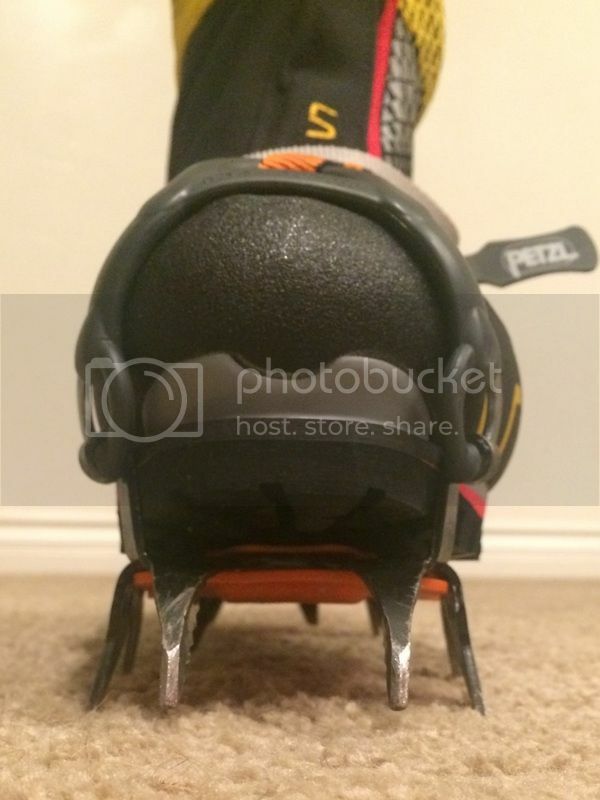 It has a stiff sole and ankle articulation has good range. I was in a warm house (not ideal conditions, obviously), and the G2 was quite warm, I had to take it off after a few minutes. 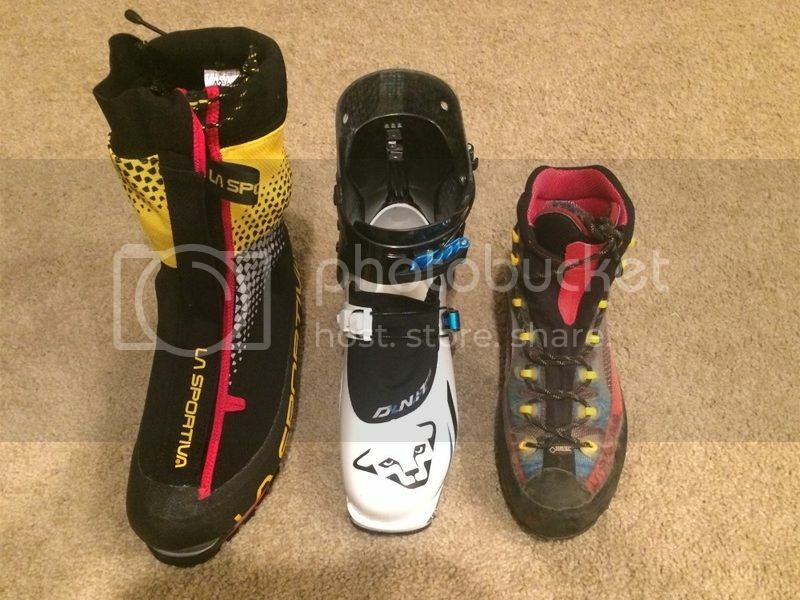 I'll use this boot for winter mountaineering in the Sierras, I'll try it out ice climbing, and hopefully Rainier, Denali, and some 6-7000 meter peaks. Futher reviews coming. Inside the shell is a perforated liner with thermo-reflective aluminum for warmth. There were two glue spots on the yellow footbed on each boot, one at the heel and another at near the toes, presumably from constructing the midsole. This was easy to peel off. It's very easy to get the liner into the shell (when it's on your foot). Showing the sole on a level surface. Note the very thin arch. Inner liner compared to the Dynafit DyNA PDG liner in size 27. The G2 liner is a bit smaller. 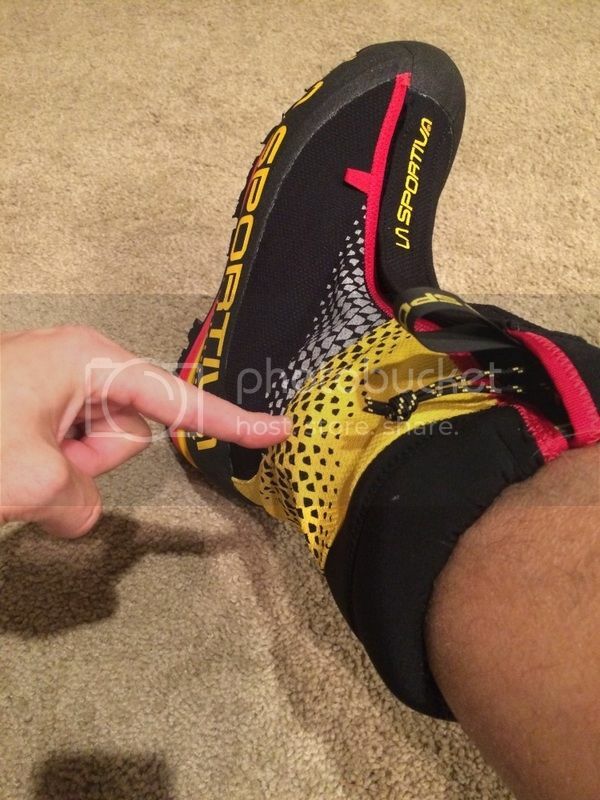 PDG liner is 146 g with the footbed included. 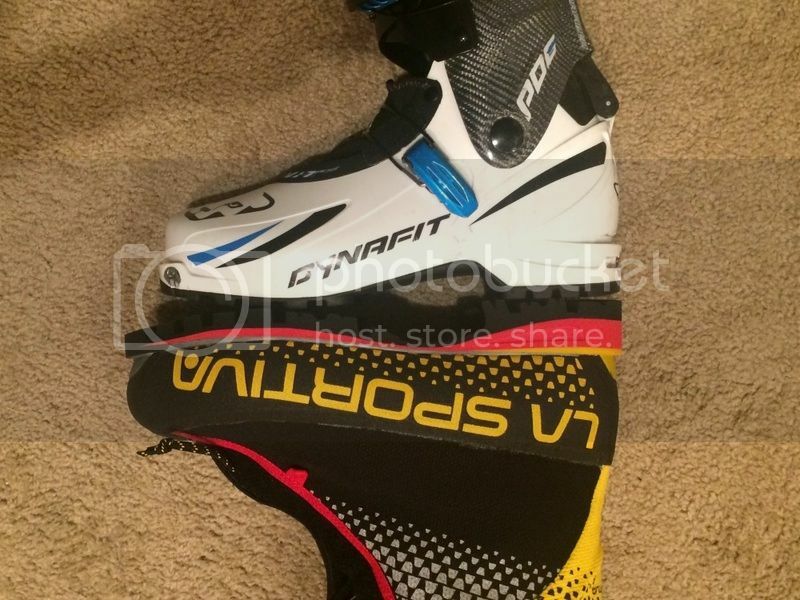 G2 liner is 109 g.
Showing the size difference between shells for the G2 and Dynafit PDG (size 27). G2 is a much larger boot. 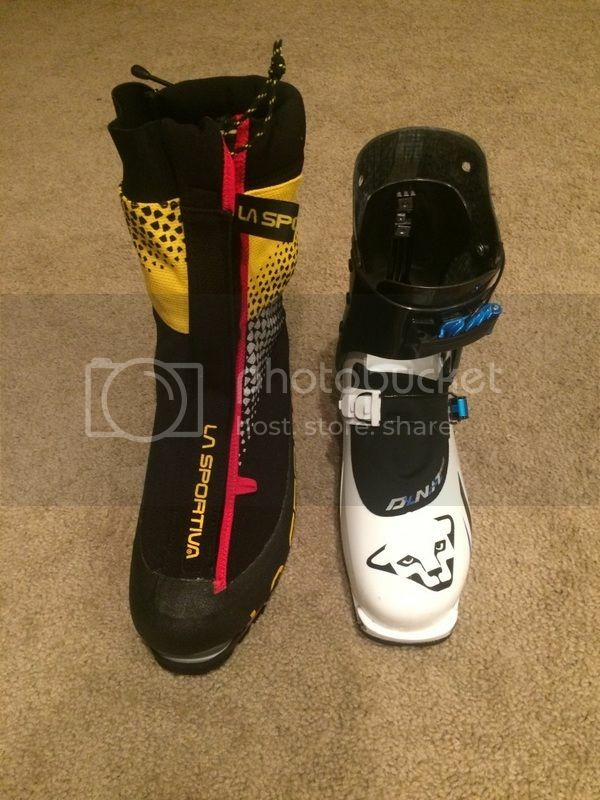 The PDG is a very small, low volume ski boot compared to most. 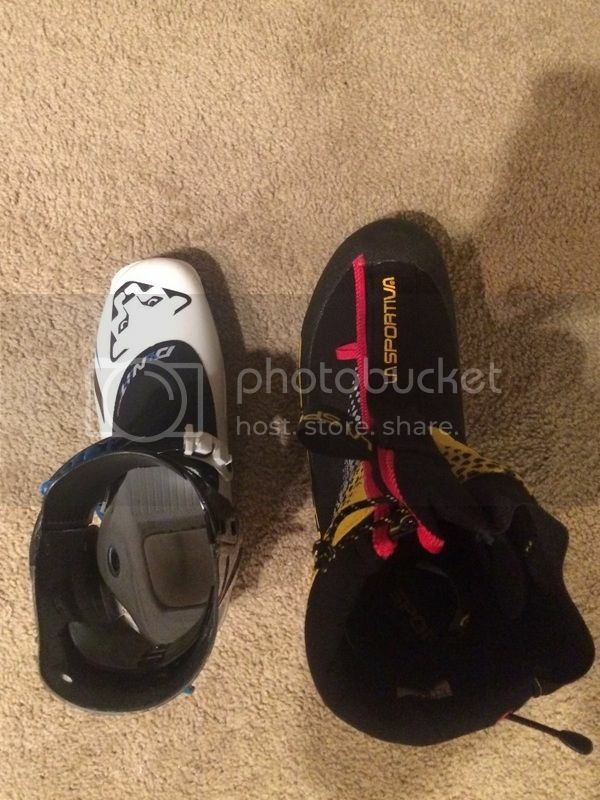 Thanks for the review, wondering if you had a chance to get them out a few times this winter. 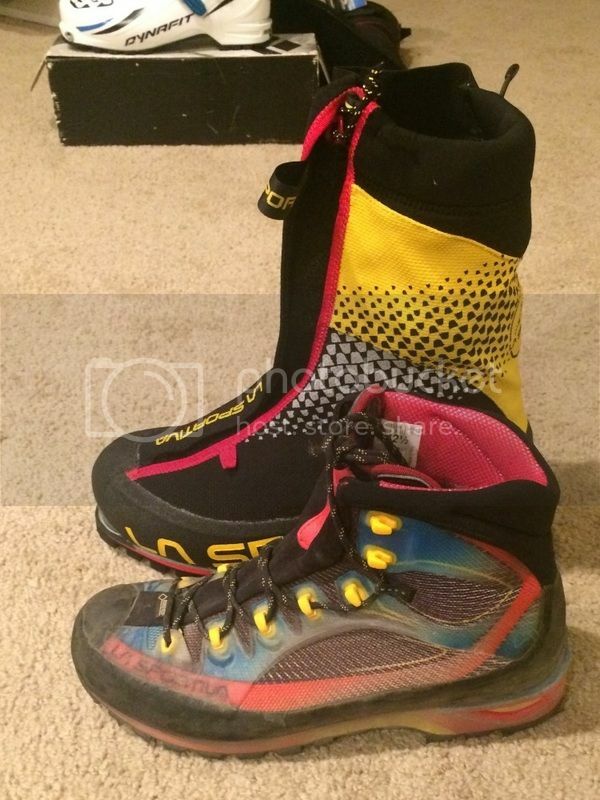 I am headed to Peru this summer , I am thinking about these boots, but concerned they may be to hot. Temps should be 0-10 at night and up to 20 during the day. Unfortunately, I haven't had a chance to use them yet. - I bought a new pair, I normally wear 42-43, my G2's are 44. Perfect fit with winter socks. - I had to wear them for nearly 15 hours on the airplane towards Russia. No problem what so ever. Easy to wear, easy to open and close. Especially compared to other bots that don't have the BOA system. 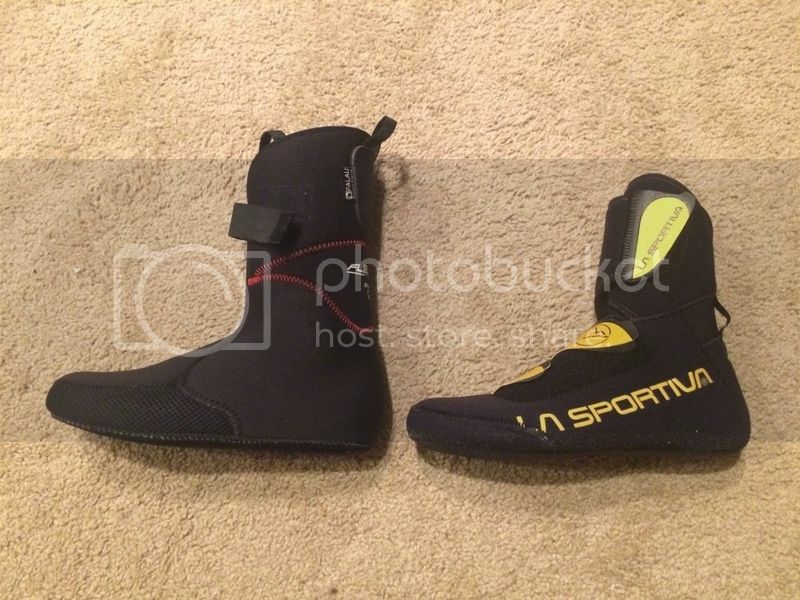 - I feel as if I had the perfect boots. I wore them in temperatures between -+25 Celsius and -20 Celsius and my feet felt perfect. 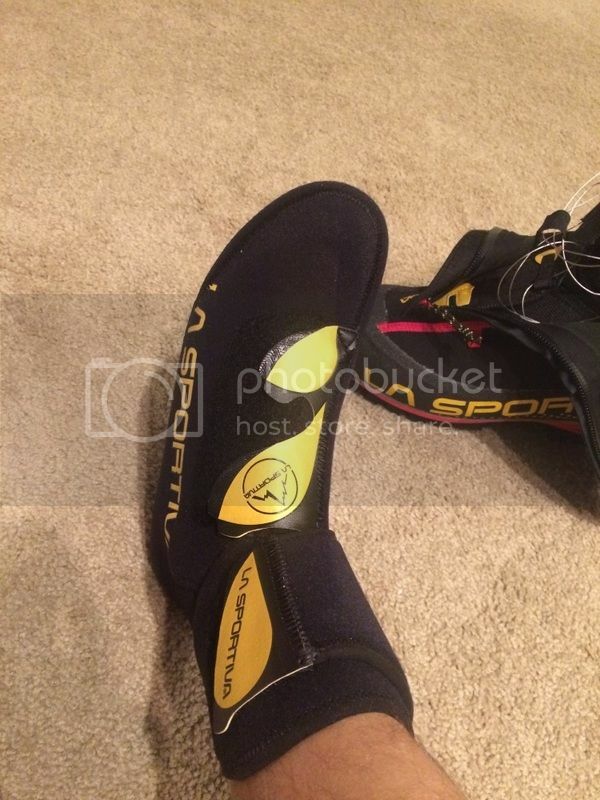 - During the night time I just put the inner boots in my sleeping bag and by morning they were dry and cozy. The EVA does not absorb sweat so they dry really fast. I think in the daytime you just need 15 minutes of sun (and positive temperatures) to dry the inner boot, no matter how much your feet sweat. Well... to get right to the point... the BOA system failed. The steel cable just came of from the upper system. I nearly had a heart attack as this happened when I was in the Priut basecamp at 4100m. I have put photos for you to see what happened. Fortunately I did not panic and improvised a quick DIY fix. 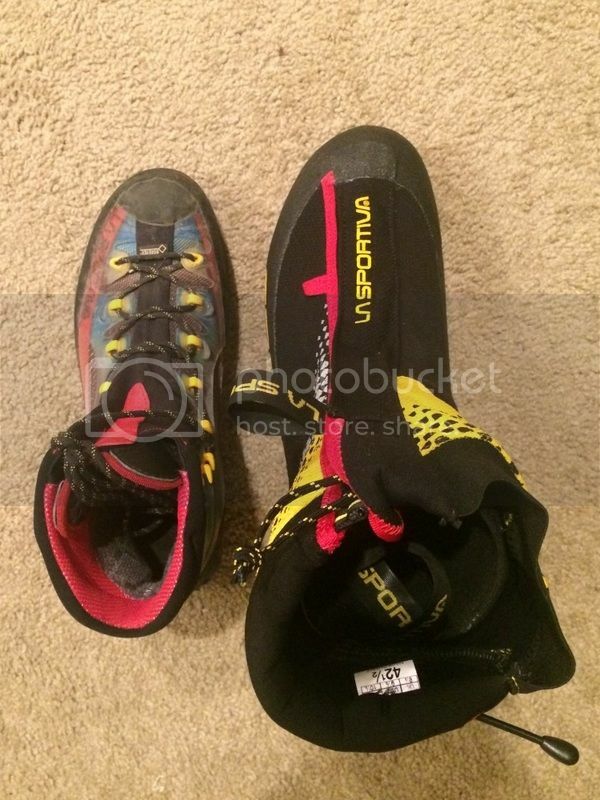 Now I am still in vacation but as soon as I get home I will send La Sportiva a message with the pictures to see what they think about this problem and go back to the shop for a new pair. 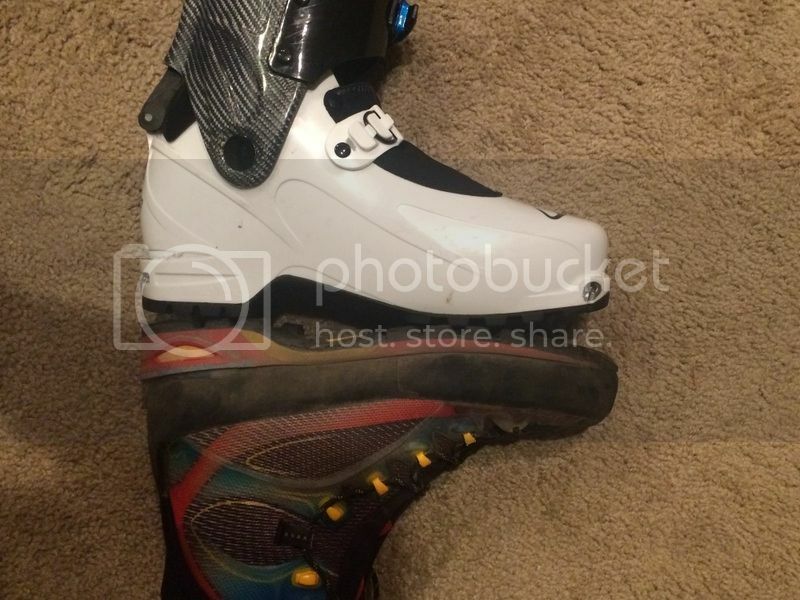 I still want this boot. It's just to perfect to let it go because of a BOA failure. 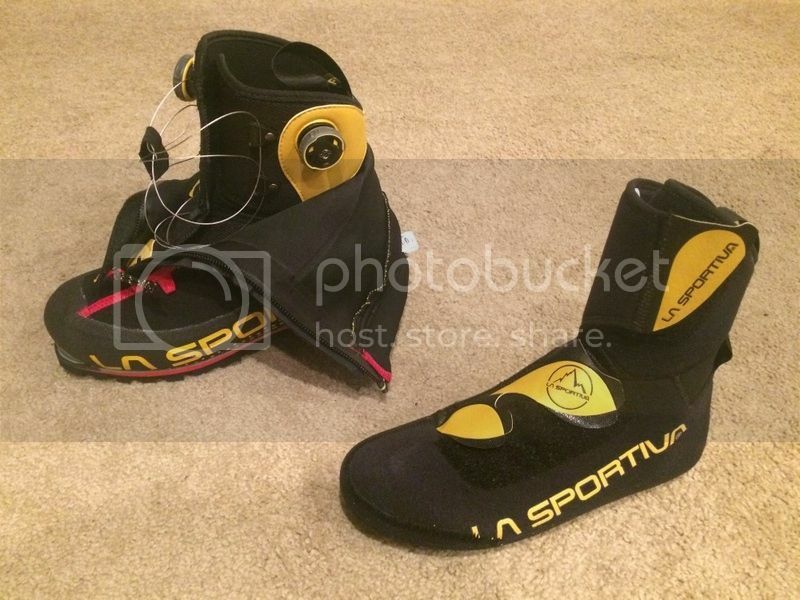 It's not La Sportiva's fault, it's the BOA system that's not perfect.. as it seems. It's just to hard for me to get back to standard laces after spending these weeks up on Elbrus with the G2. I love these boots. 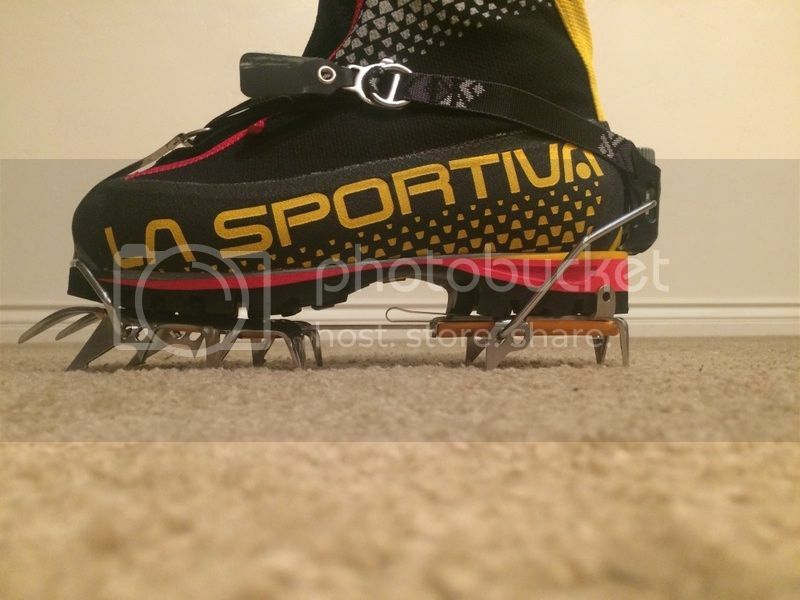 I will let you know what La Sportiva had to say about this problem. Thanks for the review! 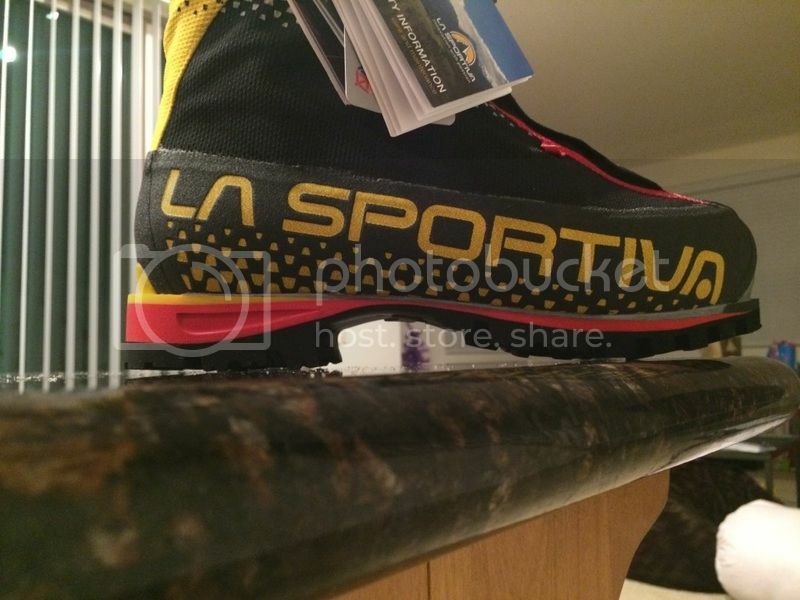 Please do let us know what La Sportiva says. And congrats on Elbrus! Generated in 0.145 seconds in which 0.126 seconds were spent on a total of 14 queries. Zlib compression disabled.